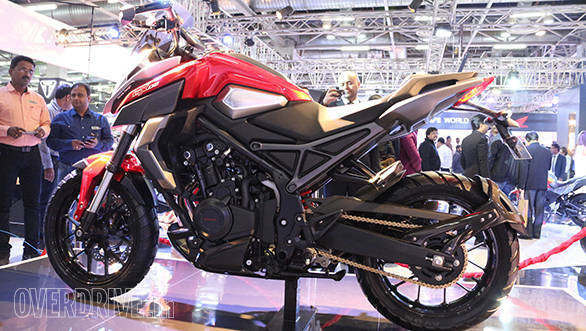 The CX-02 is the next generation of the CX-01 that was shown at the 2014 Auto Expo. Like the earlier bike, this one has been designed completely in house at Honda's Research and Development Design facility in Haryana. The focus with the new concept was to engineer it to be closer to production ready as the old concept was proving to be too expensive to be considered for production. Honda has also changed the powertrain and while they're not specifying numbers the engine appears to be a parallel twin motor displacing 400-500cc which could be borrowed from the CBR500 family of bikes. 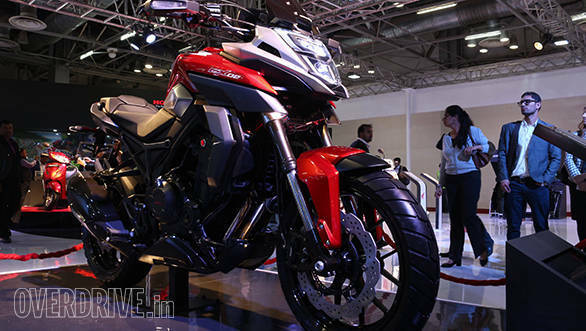 The engine though isn't as important to the concept of the motorcycle and this could change based on requirement. The bike features edgy styling that is identifiable with an adventure tourer but on a closer look things like the footpegs and switchgear appear quite production ready. There's even a horn. Things that could change before production, if the bike was to make it, are the funky twin port exhaust design and the LCD touch screen instrument cluster that swivels at the base so the rider can change the angle to make it more legible in sunlight. The concept bike wears dirt biased but road going Avon tyres with blocky grooves, indicating its ability to handle all forms of terrain. and the front end features a long travel upside down fork that Honda says has been inspired by the unit on a CRF dirt bike. The rear is slim and attractive with a couple of hollow bits that could double as a grab rail. Overall, the bike looks muscular and edgy; there's not a bad angle on it. 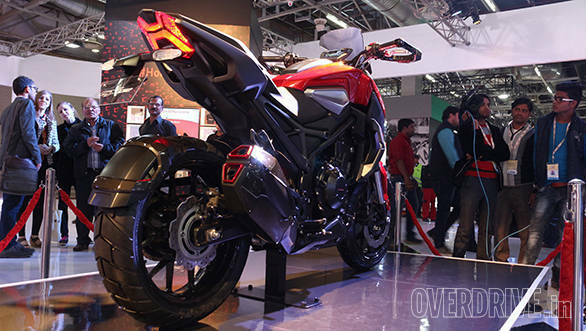 The bike runs a evolution of the frame seen on the first concept and that had its origins in a CBR250. Braking is handled by single discs at both ends and the concept bike had ABS. Honda says that traction control is also part of the plan. Talking to one of the people involved with the project we discovered that this bike can be put into production quite quickly if the nod comes from above. The CX-02's destiny now lies in the hand of upper management who have to decide if and when they feel India is ready for such a product. We say now!